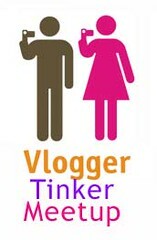 Kiruba announces the Vloggers Tinker Meetup to be held tomorrow at Virugambakam, Chennai. This would be a good start to popularize the idea of Video Blogging in India. Tinker as in dirtying your hands. Meetup as in getting together. Gotcha? It’s a bunch of folks who are very interested in video blogging getting together to tinker with technology, playing around with stuff and sharing ideas and learnings. A few of us realised that there is a small learning curve when it comes to video blogging and we decided to scale that up ourselves with each other’s help. The mantra is simple: Learning by doing and sharing the learning. As you can guess, this isn’t like the normal blog meetups where people sit around and talk. This will be a meetup where we practically do things – learn to shoot videos, tinker around with editing, simple scriptwriting, play around with different tools, find out about various video formats and many such practical stuff. Infact, at the end of the meetup, we all aim to make one video blog each that we publish on our site. That’ll be the proof of learning. In short, we dirty our hands. And oh, also have lots fun in the process. Time: 10:00 AM to 2:00 PM. It’s flexible. Can leave anytime convenient. Can even stay longer. Where: A small apartment converted into an office. It’s my wife’s web development shop that she has let us use. We’ll have the entire place for ourselves. What’ll it have: 7 computers, unlimited broadband Interent and Wi-Fi. So, lug your laptops and handycams along. Address: 82, Raj Paris Apts, Kamaraj street, Virugambakkam, Chennai-92. (Near Avichi school). I’ll see if I can upload a map. 98415 97744 will be your number to call for directions. That’s mine. Why? : Good question. This is a warmup to the bigger BlogCamp. It’s a great way to get the best minds together. It’ll not only help us learn but give us ideas in planning for the video blogging session at BlogCamp. RSVP: We have place only for 15 folks. So, drop your name, your blog URL in the Tinker Wiki. The first 15 folks get to make it. What should I bring: Lots of enthusiasm. Passion for learning. Willingness to share knowledge. And oh, bring along some snacks to eat. Who’s coming? : We are inviting some thorough professionals. Alaphia from NDTV is coming who’ll give us tips on talking into the camera and getting rid of jitters while doing that. We’re having a professional video documentor joining in who’ll guide us on handling the camera. We’re having major enthu tech geeks who are making video blogs themselves who’ll share their experiences. More in the pipeline. You are free to suggest. This is our show. And we run it togther. Wanna join in? Drop your name in the Tinker Wiki.